Dropping for snappers and grunts, on the Miss Islamorada - not exactly glamour fishing, but a heck of a lot of fun. Fishing on a head boat is cramped, difficult, rife with tangles, and rarely as productive as fishing from your own boat. It’s also an awesome reminder as to why we buy and maintain our own private fishing boats. And if you step aboard with the right level of expectations, it can also be a heck of a lot of fun. Last winter my family and I spent a few days in the Florida Keys, and on a whim, we bought spots along the rain of the Miss Islamorada for a day of snapper fishing. 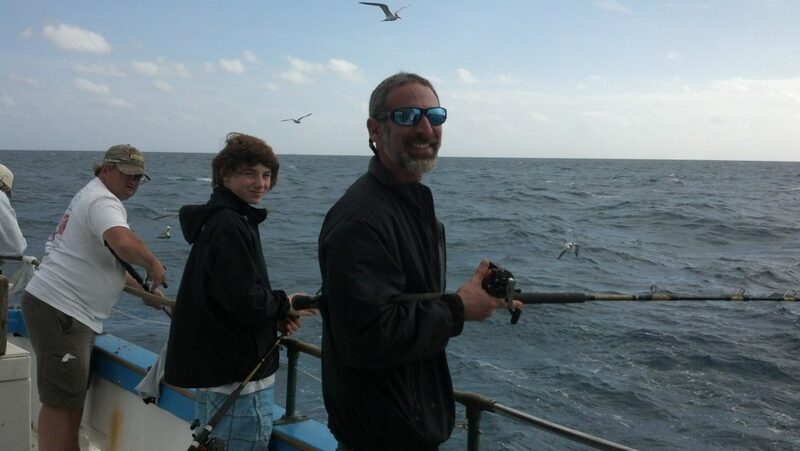 My son Max (center) and I, dropping for snappers and grunts, on the Miss Islamorada – not exactly glamour fishing, but a heck of a lot of fun. 1. If you can, bring your own gear. Most of the “free” gear provided is in pretty terrible shape on the average head boat. 2. Set aside some cash to tip the mates. Even if you’re a competent angler you’ll still need their help when someone of lesser experience tangles your line, or casts a hook into your shoulder (yeah, that happens too). 3. Try to get a spot near the stern, if the boat will be fishing at anchor. That’s where the chum is, that’s where the current pulls the lines, and that’s commonly where the most fish are caught. 4. Bring your own box lunch. Never, ever, ever eat from the “galley” of a head boat. 5. If you bring up a large fish, don’t try to swing it over the rail—many fish have been lost this way. Call for help from the mate, and he’ll bring a gaff or net. Also remember to keep your temper in check no matter how rookie a mistake the people around you might make. Everyone’s just out to have a good time, and if you keep your expectations low and your attitude good, you’re going to have one, too. On top of that, the next time you go fishing from your own boat you’ll appreciate it that much more.